The ability to make quick, well-informed decisions is critical to competitiveness and growth for most companies. 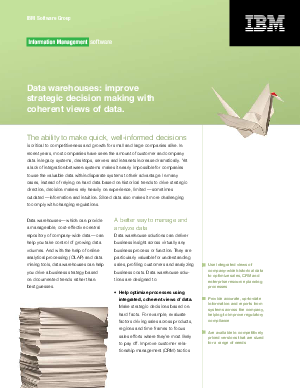 Read the white paper to see how Data warehouse solutions can deliver business insight across virtually any business process or function. And also how they're particularly valuable for understanding sales, profiling customers and analyzing business costs.